While my mind was acknowledging the desert and mid-spring heat, the heart immediately started to race from excitement — in a brief moment I forgot where I was. I almost felt the breathe of Arctic wind against my face and I tricked myself into believing that sounds of my footsteps resembled walking in a snow. We were flying from San Francisco, CA to Albuquerque, NM. Although, there were airports closer to White Sands National Monument, the prices were not reasonable. The round trip ticket price was $266 per person (United). We rented a car with Avis because it was the cheapest option. We did stop in Artesia, NM and visited Carlsbad Caverns National Park on our first day, however it is a story for another post. The price of car for two days was around $66. Keep in mind that we didn't pay for insurance, since our credit card provides essential coverage for rented cars. The total trip (ABQ — Artesia — Carlsbad Caverns — White Sands — Alamogordo — Very Large Array — ABQ) took us around 800 miles or 14 hours driving time. We spent around $70 on gas for our rented Kia Soul. And yes — gas is much cheaper than in California. 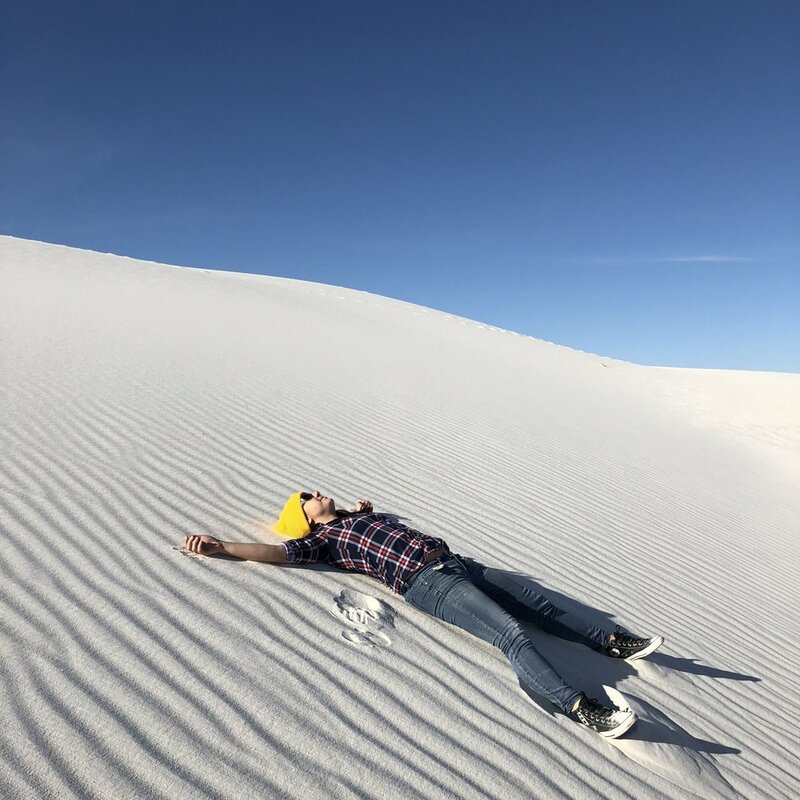 We spent around 4 hours in White Sands. We didn't hike much (however we did spend some time hiking through dunes to find a spot without crowds), joined the Sunset guided tour (which we escaped after first 15 minutes), and took our time to take photos and sled. 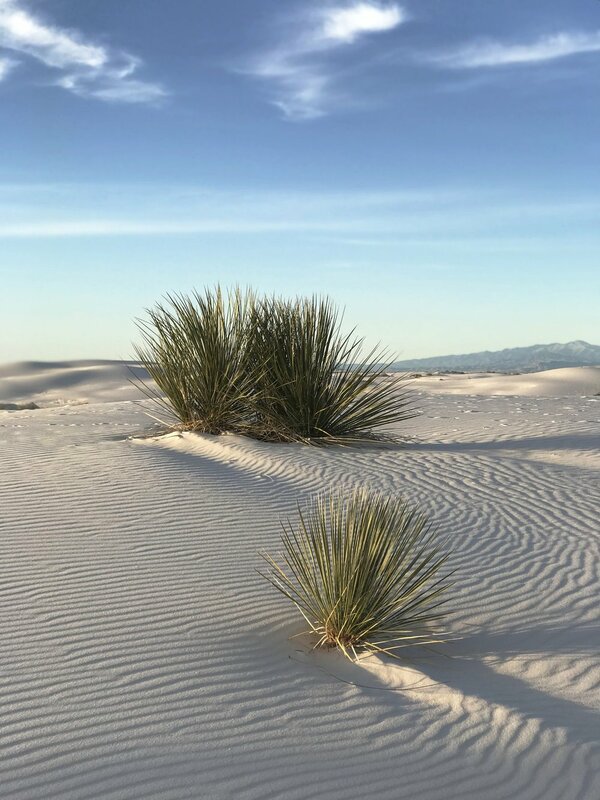 White Sands National Monument offers plenty hiking trails — make sure to check them out if you have more time. We stayed in Artesia, NM in Budget Inn, which cost us $106 per night; and in Motel 6 in Alamogordo, priced at $69 per night. One Sunday morning I was walking down Valencia Street when stopped by my favorite book store — Dog Eared Books. As usual, the magazine stand was blossoming with the independent issuers. However, my eyes deceitfully were drawn to the cover of the Fall/Winter 2017 issue of Allegory Ridge. The ranger-alike guy was walking dunes of pure white sand, with desert plants breaking here and there from the ground. I bought the magazine and when I brought it home, full of excitement, my roommate Yuliya and I decided that we should go there one day to explore the natural phenomenon. 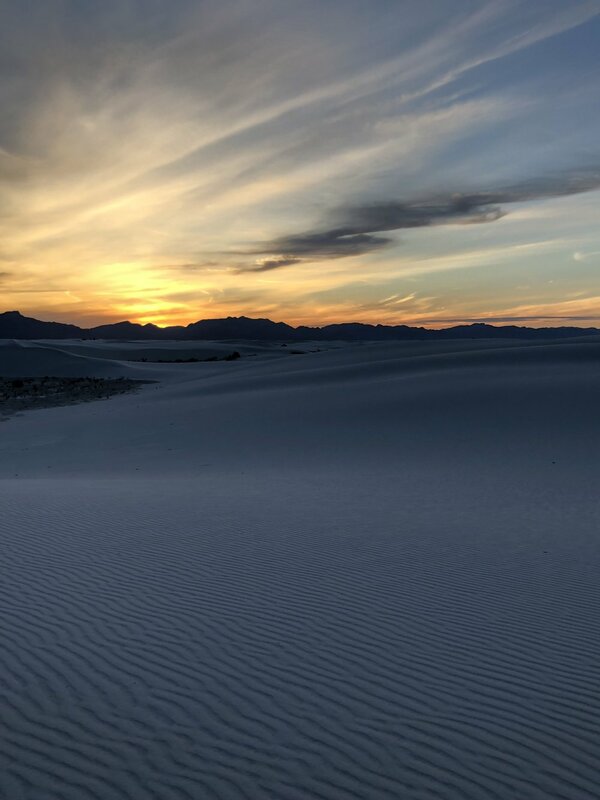 White Sands National Monument lies around 250 miles South from Albuquerque International Sunport. Our tiny United Express plane landed close to midnight on Friday and we were ready to venture onto our journey to the unknown. Hungry, we stopped at the nearest McDonald's and got some Happy Meals. That was the moment when we met our new friend Serge The Whale, a frog from the tropic forests. It took us around 4 hours to get to our motel and fall asleep before waking up to the adventure next day. The entrance fee to the park is $5. However, we got lucky — we arrived on a first day of National Park Week and got a free admission. 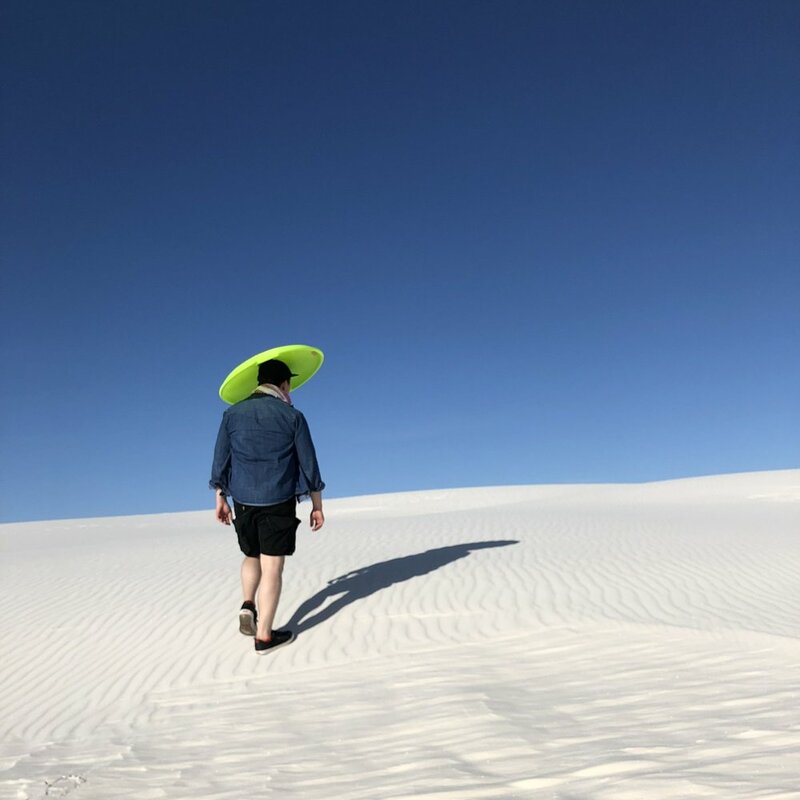 One of the funniest activities in White Sands National Monument is sledding down sandy hills, so we bought snow saucers in a gift store (~$15) and wax. Hint: The gift store buys them back for $5, so you can save some money. On approaching the gates to the park, you can start to wave goodbye to the paved road. With every feet approaching the Big Dunes, vegetation becomes sparser and in a moment you start driving on hard gypsum. The nature around you mesmerizes. All you want to do is to run towards the hill and sled down, pretending it is Christmas time. First few attempts were not really successful — it took us a while to understand the physics of the activity, how to use the wax, how steep the hill should be, and how to balance the weights on a sand saucer. When you crack the code, all you want to do is to be running around like a small child and laugh all the way long. 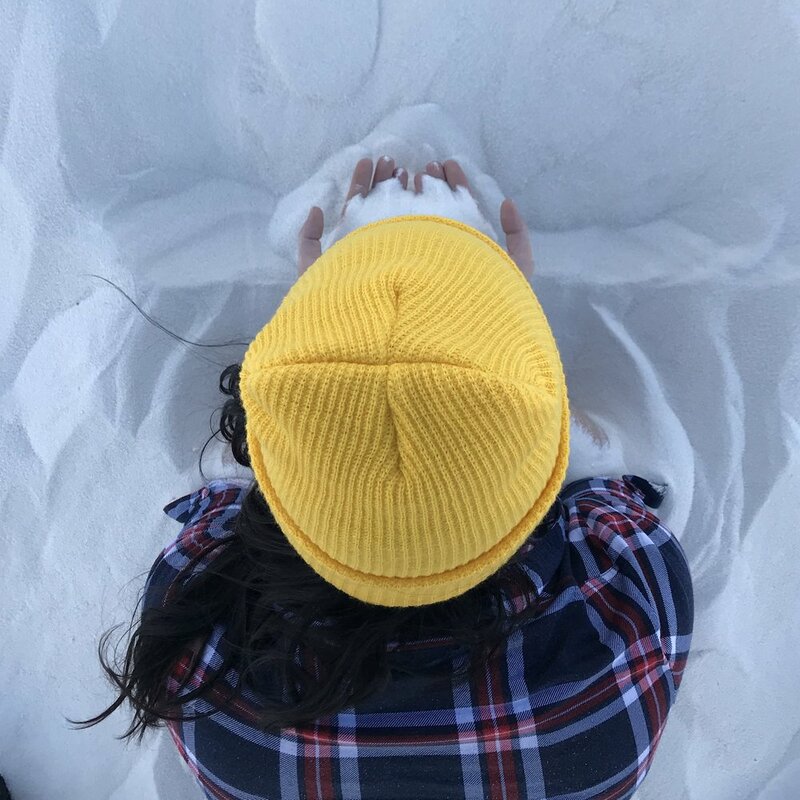 White Sands are really good at producing the sincere happiness. We closed the day with a beautiful sunset. Right on schedule, at 7:34 pm, the sky began to burn orange and pink. The plants started to dance and move. It got cold really fast, with a strong wind starting to blow from the mountains (I just made it up), swiping the footprint off the sand. The desert entered full-on restoration mode — so by the sunrise dunes would be pure and virgin again. On our way back to ABQ, we really wanted to stop by Bandelier National Monument but didn't really have enough time before catching our flight. It was decided to take a detour and stop by Very Large Array (VLA), 50 miles east from Socorro, NM. I suggest you make a stop if you have time. However, I do not believe it is worth it to drive there specifically. $6 admission fee gives you access to the museum and some exhibitions, but there's only one directly accessible telescope, while other 26 telescopes are far beyond iPhone camera reach, standing still behind the No Trespassing sign. VLA is used by astronomers to observe black holes and gas motions in the center of the Milky Way, which makes it cool. 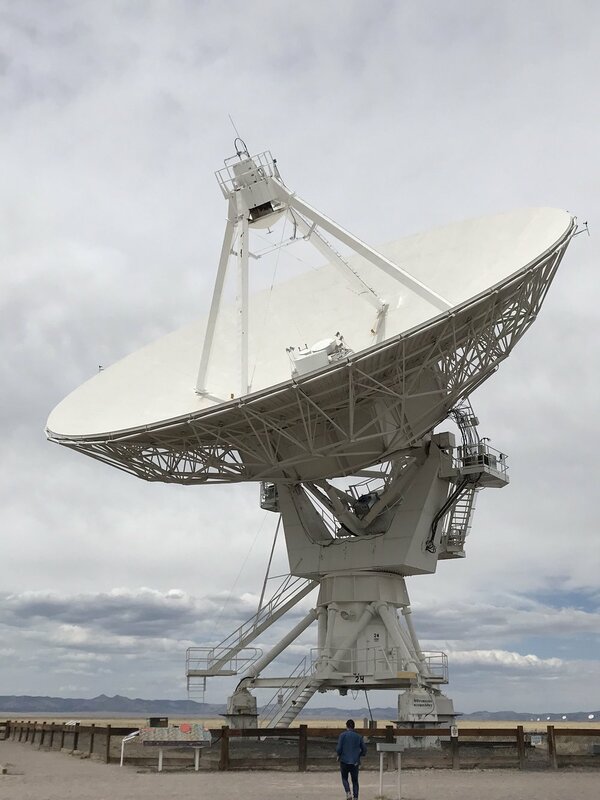 All the trip long we were joking about encountering UFO and aliens, so VLA became a satisfying stop to feel connected to the cosmogonical networks. The highlight of VLA was a rattle snack under the car. It was really scary. Mind your steps!